Rackspace Deployment Services Early Access Video Guide Shows How to Setup Rackspace Cloud Server, Load Balancers, Cloud Database in easy clicks from GUI. Really only GUI no CLI for setup of WordPress, Magento like PHP, MySQL services plus other variety of services like for running any PHP App to Rails. Practically, if you are not included in the Early Access, then you will have to wait for the public release or contact support (neither we can provide any official information nor this is an endorsed article). This video guide is purely from our point of view on technical experience. If you are not sure about the Cloud Computing Service Models, please read it first. Honestly, I accidentally logged in to Rackspace Cloud Account to create a nginx instance, for past two months, for various reasons, I went a bit busy and actually was not aware of this Rackspace Deployment Services. If you have Rackspace Cloud Managed account (be it Cloud Sites or Managed Server or anything else), you are well aware of the fact that – there is basically no need no login to Control panel ! Practically there is no downtime, no one can hack the backend, no headache. The payable money goes credit card, no one possibly goes to check the invoice. 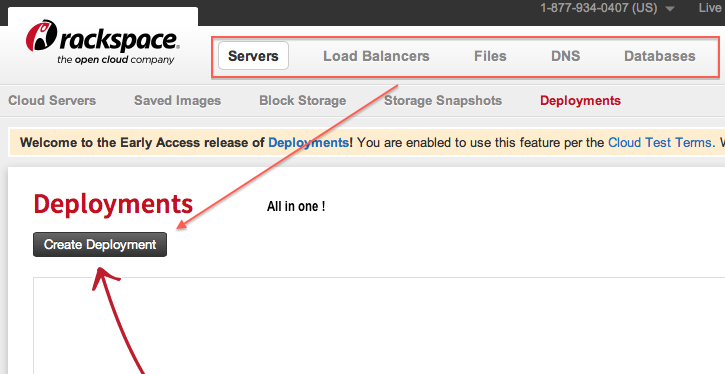 Suddenly I noticed this Rackspace Deployment Services link and obviously changed my mind from nginx to this one. I am using computer from the age of 5 yrs, servers possibly since a decade, honestly I never saw such level of coding where a so big setup can be created within few minutes. Obviously the whole setup is based on scripts, but making the integration with a nice looking web based GUI, is not really easy. Cloud Sites always has some plus points of easiness for WordPress like PHP MySQL applications but this easiness to create a whole huge setup probably will convert some Cloud Sites users to Cloud Server users. Actually there can be cost reduction for some users. Obviously, there are some points can be improved and obviously they will be, but from first glance, really we can say – it made the setup of an IaaS very easy. This Article Has Been Shared 6805 Times! Cite this article as: Abhishek Ghosh, "Rackspace Deployment Services Early Access Video Guide," in The Customize Windows, August 25, 2013, April 21, 2019, https://thecustomizewindows.com/2013/08/rackspace-deployment-services-early-access-video-guide/.